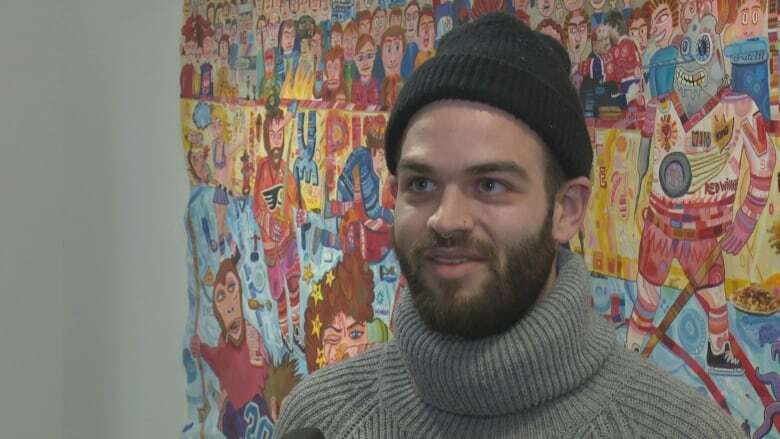 An art gallery in Windsor, Ont., is taking the worship of hockey to the next level. 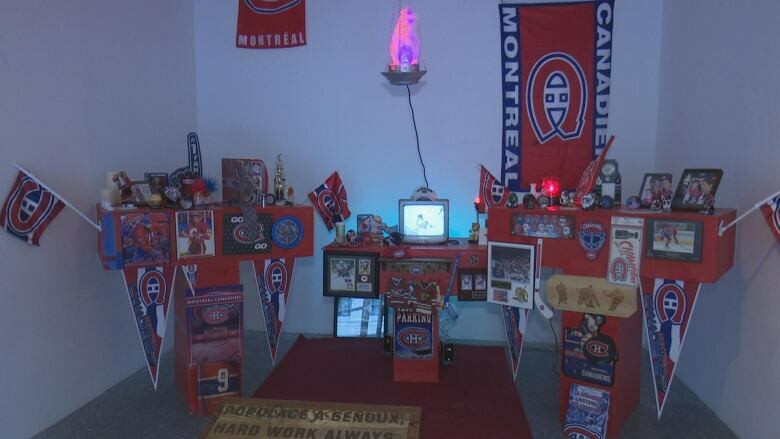 A Montreal-based art show is taking the worship of hockey to the next level, even offering a "confessional." The exhibit — now at Windsor, Ont. 's Artcite Inc. — is called "The Temple of the Glorious." The multimedia art show was put together by artist Arthur Desmarteaux, who attended the opening of the Windsor show Jan. 11. "[Hockey] is becoming a religion," said Desmarteaux. "The messenger of the good news is the television, with Hockey Night in Canada." The Montreal artist is also a puppeteer and printmaker. Desmarteaux said the show is a "dark humour piece" that is also critical of different violent aspects surrounding the sport. The "confessional" part of the exhibit is called "Exercise in self-mutilation" and a hockey coach "screams" what Desmarteaux calls a motivational speech. The speech is bilingual. The main part of the exhibit is an altar, where people are encouraged to place offerings — but no cash. Instead, Desmarteaux is hoping people will bring their hockey knick knacks. Lucas Cabral, executive director at Artcite, is excited about the exhibit that's kicking off its 2019 gallery season. "Hockey has made its way into the tiniest corners of homes," said Cabral, who was surprised at what people were putting on the altar. Things that have been dropped off so far include hockey pucks, mini Stanley cups, towels and troll dolls. "People are really excited," said Cabral. "It's a dynamic exhibition. People are really connecting to it." The exhibit features a stained glass piece and a photomontage. Desmarteaux said the largest painting in the exhibit is of a brawl. "There's a lot of detail," said Desmarteaux. "It's very colourful." LISTEN: Montreal artist spoke to Windsor Morning's Tony Doucette about the show.